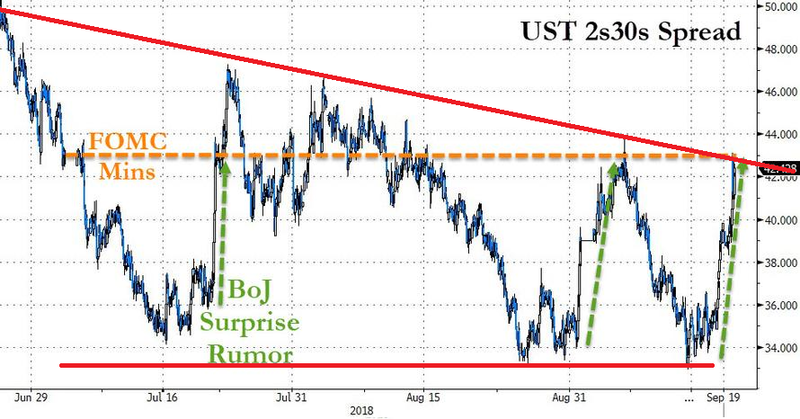 THE FED MAY BE FORCED TO OVER-TIGHTEN DUE TO AN END OF CYCLE "TIGHTENING TANTRUM"
With 30Y yields blowing out, the long end is "coming unglued" in the words of Nomura's x-asset strategist Charlie McElligott, who writes today that as the "bear (steepening) raid” in US Treasurys grinds-on, the Fed skeptics (i.e. doves) are being forced to converge to the 2019 dots, with EDZ8-EDZ9 now implying 51bps of hikes next yr (from just 34 at start of last week), a topic we discussed earlier, and is the reason why the FOMC's median 2019 dot will be so closely watched. Whatever the reason, the bear steepener is also emblematic of McElligott's "two speed year" thesis, in which the market macro regime realigns due to the "QE into QT" transition (from my “Cyclical Melt-Up” phase ONE of the first six months of the year, to the “Financial Conditions Tightening Tantrum” phase TWO), which the Nomura strategist calls the standard “late-cycle” economic- and inflationary- overshoot (kinda feels like the “now,” amirite?!) "THEN violently spasms and lunges into a new reality where the Fed is then forced to “over-tighten” at some point in the near-future—say between 1Q or 2Q of 2019." And, as evidence of his thesis, McElligott points to yesterday’s Fedex earnings print, where despite raising full-year guidance by 20c/share (something that would have likely merited a +3% to +4% move in recent quarters), "the 'classic late cycle' issue of INCREASED LABOR COSTS reducing earnings was instead punished -5.5%, the largest down move in over 5 years." Despite this Fed micro-management, I think the Equities market will continue to negatively-respond to the idea of resuming tightening, especially as the positive tailwinds of the fiscal stimulus sees “diminishing returns” and tighter financial conditions “bite” economic activity. For the long-suffering bears, McEllgiott notes that '"only THEN do you get “risk-off” trades and the larger “Value (cheap stuff left-behind) over Growth (crowded expensive stuff)” trade in U.S. Equities."